KIEV, Ukraine -- Ukraine and Russia share a common history, but since the collapse of the Soviet Union and Ukraine's independence, the two countries have taken different paths. The question is whether that divide is now shrinking. Russian President Dmitry Medvedev (L) shakes hands with Ukrainian President Viktor Yanukovych (R) at the Kremlin in Moscow on March 5. Igor Chabyis, director of the Center of Russian Studies at the People’s Friendship University of Russia in Moscow, says the two countries take very different approaches to the past. “Ukraine is moving toward exposing Stalinist terror, but Russia is on the way of restoring the Stalinist ideal,” says Chabyis. Moscow authorities are planning to paste Joseph Stalin's image on billboards for the May celebration of the 65th anniversary of the Soviet Union's victory in World War ll. Ukraine concertedly let go of its leftover past during Victor Yushchenko’s presidency over last five years. He put all his efforts into making secrets from the past widely known. Various groups have organized efforts to unveil the crimes of the Communist regime. The Security Service of Ukraine (SBU) has also exposed the facts of the terror that happened on Ukrainian soil, in particular, the 1932-33 famine. During Yushchenko’s tenure, the media became much freer and as the number of political parties proliferated, more political forces came on the scene to defend their interests. But Russia has a different situation under Prime Minister Vladimir Putin’s United Russia Party dominating in the country and seeing Ukraine as the loser because the financial and political crisis over the last several years have yielded a stifling struggle between political rivals — former President Yushchenko and former Prime Minster Yulia Tymoshenko. Igor Chabyis considers Russia’s current policy as mainly authoritarian but not yet totalitarian. “Authoritarian regimes keep some channels unblocked and so there remains minor opportunities to express yourself, shape your position, and your viewpoint,” says the political scientist. In those “unblocked channels” are human rights organizations and small groups of citizens who join together to protect the civil rights. But the Kremlin oppresses them, trying to ban peaceful public demonstrations all over the country. Ukrainian local authorities are far fairer on this issue. “The Ukrainian perspective is very important for us. What happens in Ukraine today, is in Russia tomorrow,” said Chabyis. In January, the Kiev Court of Appeal posthumously convicted communist leaders Stalin and Molotov for engineering the 1932-33 famine, classifying it as “genocide” toward Ukrainian people in Ukraine. The decision came from criminal proceedings initiated by the SBU last May. According to official estimates, from 3 million to 7 million people died during the famine in Ukraine. Earlier, the Parliament of Ukraine had recognized the famine as genocide. A resolution supported in 13 countries including Poland, Australia, and Canada. He added that there had been a bad harvest during the 1930s that caused all Soviet nations to suffer. In that spirit, the parliamentary Assembly of the Council of Europe last December had not passed a resolution upon recognizing the famine as genocide after it was blocked by Russia. The head of Ukraine-Europe Committee Oleh Rybachuk, said Ukraine had always irritated Russia by defending its own national interests including protecting democracy, seeking entry into the European Union and NATO, and wanting the Russian navy to leave the Crimean peninsula in Ukraine. “The development model of Ukraine is a direct threat toward the Russian regime,” said Rybachuk. After the arrival of Ukraine’s fourth president in February this year, Russia-leaning Victor Yanukovych, many are concerned that Ukraine’s situation will worsen. Since coming to office, he has already suspended declassifying the SBU’s archive of secret famine documents and it is not clear whether or not it will resume. He has also overhauled the entire staff in Parliament, the bureaucracy, and local authorities. However, it is not clear if these actions are constitutional. 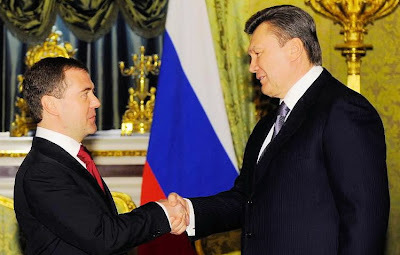 When Yanukovych took office, he changed the rules for how to form a parliamentary coalition, the constitutionality of which has been referred to the courts. UKRAINE AND RUSSIA'S TROUBLED PAST AND UNCERTAIN FUTURE.....is a very well written article and the author writes with wwisdom. FIRST, since the breakaway from the old Soviet Union the Ukraine has chosen and worked very hard at a path of freedom, growth of free enterprise and showing no hostility towards any country. Also the freedom of expression in the news media has grown immensely beyond that of Russia and the reasons are very evident. UKRAINE IS NOT RUSSIA and never will be. Yet,Russia still tries to control a country which already works with Russia but has stated by its ACTIONS it wants it own way and pursuit of life,liberty and poursuit of happiness. and RUSSIA still greatly tries to curtail the news coverage. RUSSIA should have learned by now the power is that of the people and RUSSIANS want their civil liberties as Ukranians and others in the West because these are inherent rights which can not be overlooked...They are "human rights" and they are never going to go away. A good example here is Russias planned invasion of Georgia, as its first move to regain the fifteen breakaway republics from the old Sobviet Unbion and Russia had planned this well. And like NATO or not,had it not been for NATO there possibly could still bew serious occupation in Georgia today. ..Now Russia is trying to combine Ukraine,Belarus and Kasakstan and other countries to unite but all under the banner of RUSSIA. This ia a dangerous engagement for these countries. Let them continue to work with Russia but remember RUSSIA has its own mindset and it has an agenda which is for RUSSIA. If they become too alligned with Russia it will be hard to get out and have their own freedom again. The invasion of Georgia was a violation of certain precepts of the United Nations Charter and other " Europeran peace agreements" and yet other European countriers did little to reprimand Russia because even they are intimidated. Like it or not NATO or the CSTO, let their be seveal peacemakers but without their peacemaking forces in place there will be no balance of power and that is what keeps the world at peace. "THE COLD WAR" as it was the best insurance policy for all countries including Russia and the U.S. and there was NO war and the terrorists did not dare to try their game. Underline the word " COLD." Let Ukraine grow and if the Verkhovna Rada is smart they will not pass a law abandoning relations with NATO...it does not make sense in tense times in eastern and central Europe. As the famous British statesman,Winston Churchill said," The obly real fear we have is fear itself." Ukraine does not deserve to live in fear anymore and niether do Russians...All countries in east and central Europe must now work together and keep all doors open. patriotstv.com....Ukraine is a great country---lets keep it that way!